I try out pretty much every new sci-fi show that hits the air and I’ve just recently finished up watching USA Network’s Colony series and I think it is safe to say that Colony is my favorite new sci-fi show of this season. And I’m actually starting to think that USA is making better sci-fi shows than SyFy! 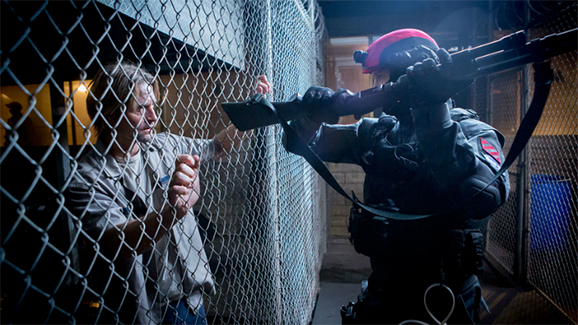 If you haven’t watched all of Colony yet, then be warned that there are some spoilers ahead. Or, catch up online here! When Colony started, I was a little iffy on how it was going to be. It’s full of genre actors and I thought that it was going to be just another sub-par genre show on alien invasion. I was wrong. It is so much more than that, and it’s not really alien invasion but alien occupation. Everyone on the ground in Los Angeles lives under “The Visitors” and the constant fear that they will be picked up and sent to “The Factory.” I can’t recall ever seeing a show quite like this (though it’s possible that I just missed something). We’ve got LA cordoned off into zones, food is being rationed, some of the Americans are working with “The Visitors” and some are part of an underground movement, “The Resistance,” and what exactly “The Factory” is remains a mystery. Check out the trailer for season one below. So far, all we know about this factory is that they pick up people of all ages and send them there. Oh, and it just happens to be in space. Hells yeah to that! We don’t really know what these people are doing in the factory or why the aliens need them to do it. We don’t know why they came to Earth, what is going on in the rest of the cities of the USA (and the world), or even if people are being snatched up for the slave labor from other cities. What’s really interesting about this show is that we haven’t really seen much of these alien visitors. The Resistance managed to kill one in a subway explosion, but just when they were about to unmask the thing, they had to run from the Red Hats (the civilian army that’s in charge). And the only glimpse space that we’ve seen is the view from The Factory. So, season one is actually more of a post-apocalyptic/ dystopian show with alien occupation undertones. If you didn’t watch all of season one, you can stream Colony online from Amazon. I’m assuming that in season two we will end up seeing more alien and space stuff as the battle between the humans and the Visitors gets more tense. Out of all the sci fi shows I’ve watched, this one has definitely kept me the most entertained. I’m still trying to make it through The Expanse from SyFy cause I keep hearing how great it is, but I’m having a really hard time getting into it. Better than Expanse? I doubt it. I’ve only watched the first two episodes of Expanse, but I gotta admit that I haven’t loved what I’ve seen. Still planning on finishing it though and seeing if it wins me over.